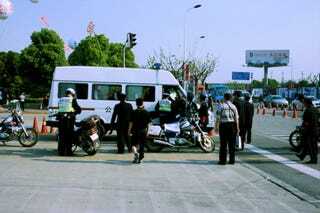 As we were waiting for our Audi-supplied car service outside the Shanghai Auto Show, we heard a bustle and some shouting behind us; soon enough two police officers dragged a struggling man by and manhandled him into the Iveco paddy wagon above. A colleague darkly noted, "Uh oh. He's filling out his organ donor card now." It's one of the odd things about Shanghai; it's a very Western-oriented city — especially the sprung-up-overnight Pudong area — but it is still part of a state not known for an emphasis on human rights; rightly or wrongly, the reaction it stirred in us was different than what we're used to when witnessing a similar arrest back home. Below are a few pictures of police vehicles. Santana wagon! Buick minivan! Weird golf cart!